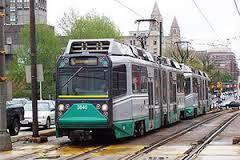 ^ transportation in Boston toady is already a mix of options. Tomorrow there’ll be more options, and much more mixing. Much ado has been bruited about what the 2024 Olympic Games might inflict upon Boston traffic; Boston parking; Boston public transit. All of this ado prevents us from hearing the underlying conversation about transportation : it will change big time, in ways that will alter almost every part of our lives, our habits, our expectations, our time. The challenge is upon us; and, as with so much that is changing in Boston, the change will happen whether we like it or not (and many of us do like it) : so, why not take charge of the change instead of passively bitching about it as others impose it on us ? What are those changes in transportation, that are already hitting us ? 1.The T, of course. Governor Baker and the legislature have got us to the threshold of reconfiguring every part of its operation : equipment, governance, work rules, administration, scheduling, outsourcing. And there are changes that go beyond what politics is likely to accept, For example : why does the T need to own and repair any buses ? Why can’t it lease them all, and have them repaired by the lessor ? Calculate the millions of dollars this would save every year. You don’t want the T’s fares hiked ? Leasing would enable the T to NOT raise fares at all. 2.T expansion. Why can’t we extend the Blue Line to Lynn, the Orange Line southwest to Needham, the Green Line north beyond West Medford, top Woburn ? As for bus routes, why not hire van-sized vehicles to serve less traveled routes and late night riders ? 3.Parking. Mayor Walsh is doing an inventory of every parking space in the entire city of Boston – an effort as momentous,. And powerful as was the Doomsday Book to William the Conqueror in 1086. We can’t effectively create new parking spaces until we know where they are most needed – and where it is most feasible to create them. 4.Transportation competition. The taxi business as we knew it is finished. Today’s taxi companies – Uber, Lyft, and Bridj; and who knows what others ? – own no vehicles and employ no drivers. 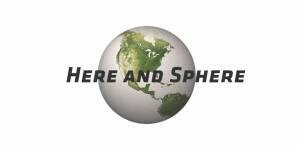 They are flexible, on demand services, the epitome of what a service business must be. 5.Cars. Some modern-day Luddites want them gone, but that’s silly. The two most significant reforms that we can do to cars are (1) make them much smaller and (2) make them much more energy efficient. European cities get by with street widths created in the 15th century, sometimes; because European cars are a s small as matchbooks and make 60 miles per gallon of gas, largely because (1) they are tiny and (2) gas costs triple in Europe what we pay. Public transit and on demand taxis cannot serve all of us. It’s nice to have the supreme flexibility of a car. But having a car does not mean having any damn car we please. For city driving, especially, we should create economic barriers to the usefulness of huge cars with large fuel consumptions. May I add that taking this policy route will also lighten the burden we now place on parking space sizes ? 6.Bicycles and Vespas. Again, European cities could not exist as they are, had not thousands of urbanites these two options. Everybody who can use a bike or Vespa in Europe does so. The same trend is imposing its truth on Boston. We should encourage it. 7.Traffic. Cities are full of traffic ? Why is t.hat a bad thing ? 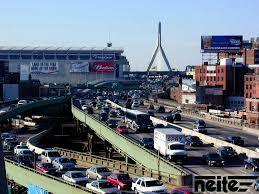 Bad would be for Boston to have no traffic. Traffic means commerce, commerce means prosperity. Yes, traffic brings noise, and slow movement, and some carbon emissions. The emissions, we can deal with. But noise and slow movement are part of the DNA of a city., if you don’[t liker them, you probably should not live in Boston, not even in its nearby communities. That, you will have to decide. One thing we can change is traffic patterns. Building a new road, however, doesn’t get us there. A new road creates new traffic. And entrances and exits create build-up and bottlenecks no matter how we design them. But we can use one-way signage to direct existing traffic onto streets where it is most needed. We can do it and should. Up to now, Boston one-ways its streets often because of neighborhood complaints. That’s reactive; it is not good leadership. To use one-waying – and other means of traffic diversion — effectively, however, we need to research traffic preferences regionally, not simply within Boston. This will be a huge undertaking for every governmental body that decides to do the research. To sum up : transportation as we have known it – cars, or trains, the T or taxis – is moving off stage, to be replaced by systems much less clumsy, less inefficient as to both costs and service, and far more individualized. We’re entering a small unit world in almost everything – the new economy is bringing it to us. Our transportation models cannot avoid the new paradigm.